Churchill Downs announced Champions Day presented by Twinspires.com, a new Derby Week event that will take place at the racetrack on Tuesday, May 1, 2018. Champions Day will delight Kentucky Derby fans by celebrating the greatest moments in the sport’s history and honoring its legendary jockeys and trainers. 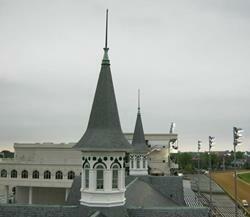 Gates open at 11:00 a.m., first post at 12:45 p.m. Tickets start at $10 at www.KentuckyDerbyWeek.com. In addition to a full day of live Thoroughbred races, this must-see event for any racing fan will offer guests the opportunity to meet famed Derby and Oaks-winning jockeys and trainers. These horse racing legends will be in the Plaza and Paddock from 12:30 p.m. – 2:30 p.m. Guests can purchase a collectible poster for the jockeys and trainers to sign. Proceeds from the poster sales will benefit the Thoroughbred Aftercare Alliance. Featured jockeys include Pat Day, winner of the Kentucky Oaks in 1988 and 2000 and the Kentucky Derby in 1992; Gary Stevens, winner of the Kentucky Oaks in 1986 and 1999 and the Kentucky Derby in 1988, 1995, and 1997; and Craig Perret who won the 1990 Kentucky Derby. Hall of Famers D. Wayne Lukas, a four-time Kentucky Derby winner in 1988, 1995, 1996 and 1999, and Carl Nafzger, who trained the 1990 and 2007 Kentucky Derby winners, will be two of several featured trainers. Champions Day guests are invited to learn from the best in the business at the Advanced Insider Handicapping Seminar presented by Twinspires.com in the Aristides Lounge from 12:00 p.m. – 12:40 p.m. “At the Races” host Steve Byk and clocker and bloodstock agent, Gary Young, will share their expertise on Derby Week handicapping. Two of the most respected handicappers in the game, Byk’s “At the Races” is Thoroughbred racing’s longest running and best known daily radio news magazine, while horses recommended by Young have accounted for three Breeders Cup and 17 Grade I races. Derby history enthusiasts will especially enjoy the Big Board on Champions Day as it brings Kentucky Derby history to life. The Kentucky Derby Museum and Churchill Downs have curated captivating oral history, fascinating trivia and archived footage of the sport’s most sensational moments to share throughout the day.